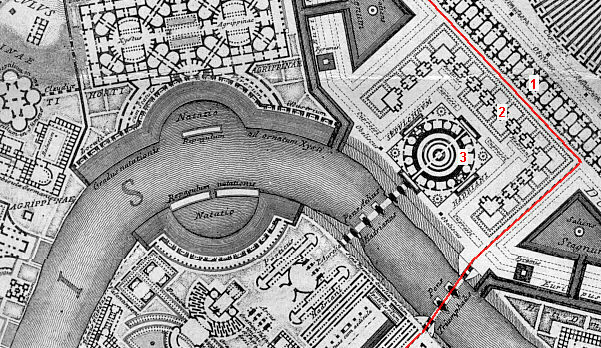 The viam triumphaiam within the Ichnographia Campus Martius begins in the Area Martis, the forecourt of the Temple of Mars which Piranesi positions within the Vatican valley. Even though there once actually was a Via Triumphalis in this section of ancient Rome, the route of the triumphal way never began here. Nevertheless, Piranesi clearly demonstrates his intentions through planimetric symbolism. The plan of the Templum Martis (1) is clearly derivative of male genitalia, and the dashed line indicating the path of the triumphal way evokes the issuance of sperm, in this case the sperm of Mars which ultimately produced the triumphant Romulus. It can even be said that the surrounding void of the Area Martis (2) represents a womb, and thus it is the Arcus Trajani (3), the Arch of Trajan, which delivers the Triumph on its way. Piranesi very carefully fused his rendition of the Triumphal Way with the origins of Rome itself. The Triumphal Way initially proceeds between a great length of tombs containing the remains of free men and slaves (1) and the multi-columned Porticus Hadriani (2), all within the shadow of Hadrian's great tomb (3). It is here that those in the march paid the departed their respects before the Triumph entered into the Campus Martius proper. The Sepulchrum Hadriani, moreover, acts as a giant knuckle around which the Triumph make a sharp turn towards the Tiber and the Triumphal Bridge. Once within the Campus Martius proper, the Triumphal Way moves along the length of an enormous stadium (1). No doubt, the intention here is for the Triumph to proceed through the stadium full of spectators. Furthermore, it is in conjunction with this Stadium that the Triumphal Way intersects a significant cross-axis. The Ara Martis (2), Rome's original altar to Mars, together with an adjacent Templum Martis (3) align with the Templum Romuli (4) that is part of the Stadium's composition. This is again a clear reference to the origins of Rome. Beyond the great Stadium, the Triumphal Way again encounters the Tiber and again makes a sharp turn. 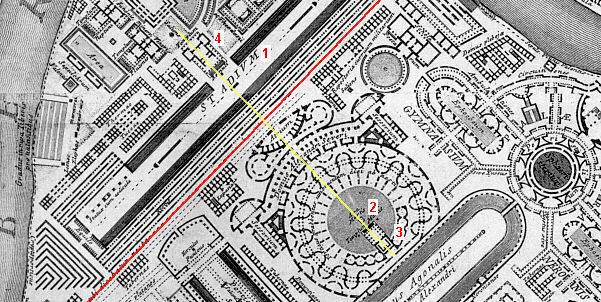 The Triumph then proceeds in a straight line between the Hecatonstylon (1), the Porticus of a Hundred Columns, and the edge of the Horti prius Pompejani dein Marci Antonii (2), the Gardens formerly of Pompey and later of Marc Antony. The Theater of Pompey (3) nearby marks the Triumphal Way's entrance into what in all respects is ancient Rome's "theater district". It is within ancient Rome's "theater district" that the Triumphal Way takes many twists and turns. Furthermore, this portion of the Campus Martius is the oldest, as it contains buildings and places dating back to the Roman Republic and earliest years of the Empire. 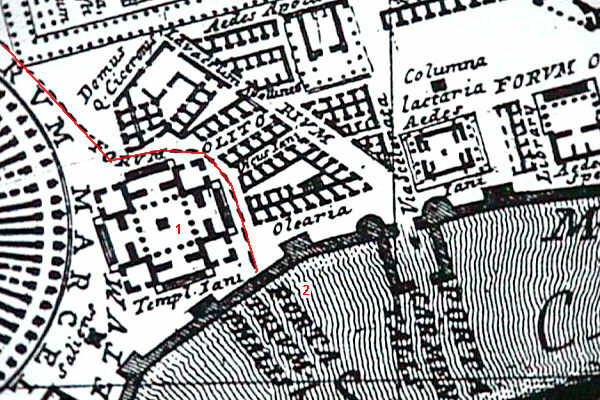 The Prata Flaminia (1), the Temple of Hercules and the Muses (2), and the Minutia Vetus (3) are among the Campus Martius' oldest structures, whereas the Porticus Octaviae (4), and the Theatrum Marcellus (5) both recall the "building boom" that occurred during the reign of Caesar Augustus. For the most part, Piranesi is relatively faithful to the correct archaeological layout of this area, however, when he deviates from historical reality, he does so intentionally. 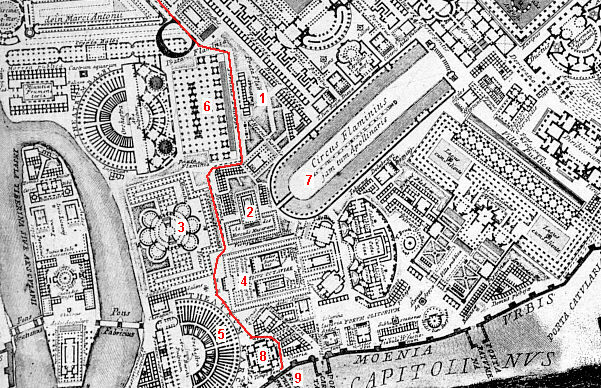 For example, Piranesi transposes the positions of the Porticus Philippi (6) and the Circus Flaminia (7), thereby placing the Porticus Philippi along the Triumphal Way. This porticus was built by and is named for L. Marcius Philippus, the stepfather of Augustus, but the name Philippi also alludes to the city of Philippi, the location of a decisive battle in the civil war after the death of Julius Caesar where Augustus was victorious and thus pledged his dedication to henceforth erect the great temple of Mars within the Roman Forum. Piranesi's Ichnographia Campus Martius rendition of the Triumphal Way finally weaves around the Templum Jani (8), the Temple of Janus, just before it reaches the Porta Triumphalis (9), the Triumphal Gate within the Servian Wall. The Triumphal Gate is the Triumphal Way's most critical juncture because it is here that the Triumph enters the actual City of Rome. The ancient Servian Wall coincided with the pomerium, the city of Rome's sacred boundary, a demarcation inside which the activities of war and burials did not normally occur. It is precisely for this reason that the Campus Martius, the fields dedicated to Mars and the exercise of Roman soldiers, lies outside the actual city. 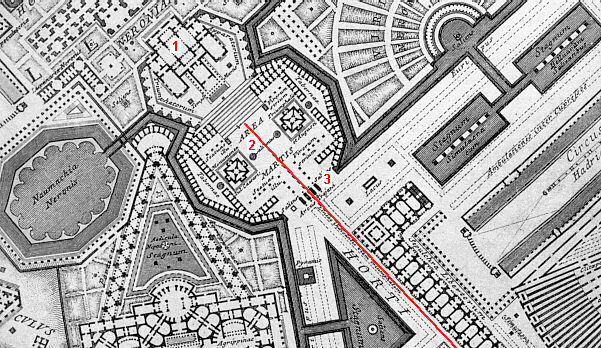 It is also worth noting that while Piranesi labels the position of the Porta Triumphalis, there is however no corresponding opening delineated within the wall. To this day, no archaeological evidence of the Triumphal Gate has yet been found, and the ancient literary evidence of the gate is ambiguous in that it suggests two possibilities, either each Triumph initialized the erection of a new gate, or, if the gate was a permanent structure, it was open during a Triumph only. 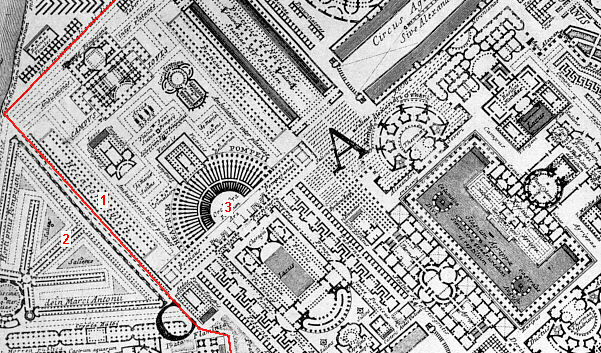 It would thus seem that Piranesi's route of the Triumphal Way through the Campus Martius carries a fair amount of correctness, and indeed culminates at a fitting conclusion. What is still unexplained, however, is the presence of the Templum Jani (1) next to the Triumphal gate (2).